Kek Lok Si Temple from the street leading up to it. I’ve just eaten some very tasty vegetarian Chinese buffet (that I would return to more than once while in Georgetown), and I’m walking around aimlessly. A couple of trishaw (bike taxi) drivers are seated on the sidewalk playing checkers with beer bottle caps. On the building across the street is a large mural of a trishaw driver lounging in his carriage, waiting for his next costumer. A good meal is an essential introduction to a place. 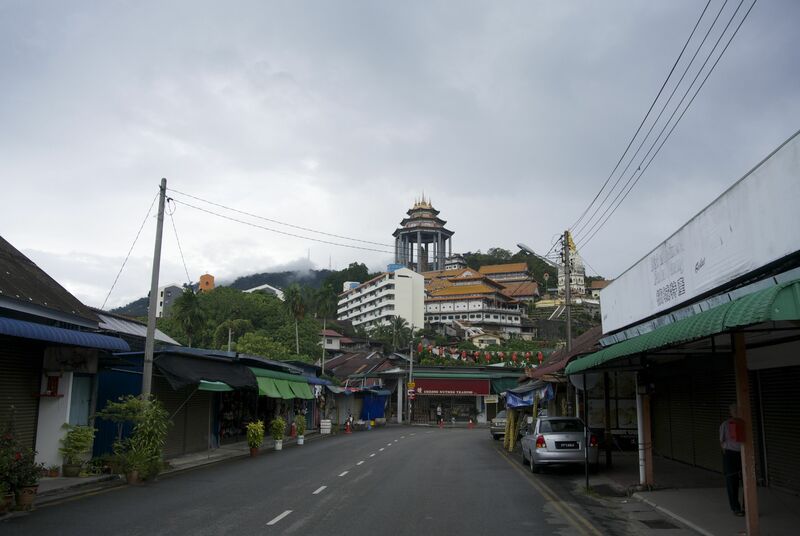 In Penang, Malaysia (Penang being the island which Georgetown – the former British capital of Malay – is situated on), finding good food is the simplest of tasks. In the morning, I have roti canai (flatbread) with a curry sauce and a coffee all for under US$2. I set out walking around the town, and see the usual ruckus. Motorbikes swerve around, stalls hawk shirts, pants, fish, whatever. As I walk past alleys I find them full of people enjoying breakfast at tables. I think to myself: this is a place I could stay for a long time. On the way to the bus terminal, waiting to cross the street – which is an acquired skill – a man carrying some bread asks me where I’m from and where I’m going. He points me in the direction of the bus terminal. From there, I go to Kek Lok Si, perhaps the largest Buddhist temple in Southeast Asia. It’s set in the hills of the sleepy town of Air Itam. Monks are chanting and in the middle of prayers. I linger for a moment and then climb to the top of the large tower. At night the streets of Little India are loud and bustling. Shops sell cloth, flowers, and Indian pop hits blare from speakers. Hawkers sell savory and sweet food from carts. Lights decorate the streets that are lively well into the evening. I have dinner at one of the vegetarian Indian restaurants and stroll up to a cart with sweets and get one of everything. I don’t really know what they are, but they’re very sweet and very good. In places where I’ve lived, I’ve always looked at those double-decker tour buses and wondered why the hell anyone would ride one. At the bus stop, a representative of the new Hop-on-Hop-off bus in Penang tells me that the service is free this week, as they just launched. I’m trying to head to Penang Hill for a hike, even though it’s a little late in the day. I get on to a packed bus and realize within moments that I’m not going for a hike this afternoon. My fate has been sealed. I manage to get a seat on the top deck and decide to take a free bus ride past all the old colonial buildings and tourist attractions. That night, back rather early, I decide to explore some of the local bars. Hong Kong Bar is probably the oldest on the island. It’s got some charm, but a little too much Aussie paraphernalia for my taste. Down the block I am roped into Five@27, a posh looking place that promises happy hour beer deals and free wifi. I take the deal to be 2 for 1, as is the standard. After my second beer, I learn that I am undertaking the buy 2 (at outrageous prices) get one free. I grudgingly drink my last beer and move on. B@92 (I guess they’re fond of the @ symbol) is owned by a Serbian-Italian expat. I arrive pretty early in the evening. I’m commanded to sit down at the table with the owner and another regular. He tells me how horrible the coffee is in Georgetown and then makes me an espresso, which is quite good. When they move inside I am again compelled to do so. A few of us are at the bar, the owner seated behind the bar but not serving anyone – he leaves this to his wife and the other woman that works there – and we are given some free glasses of Glenmorangie. I’m not arguing there. 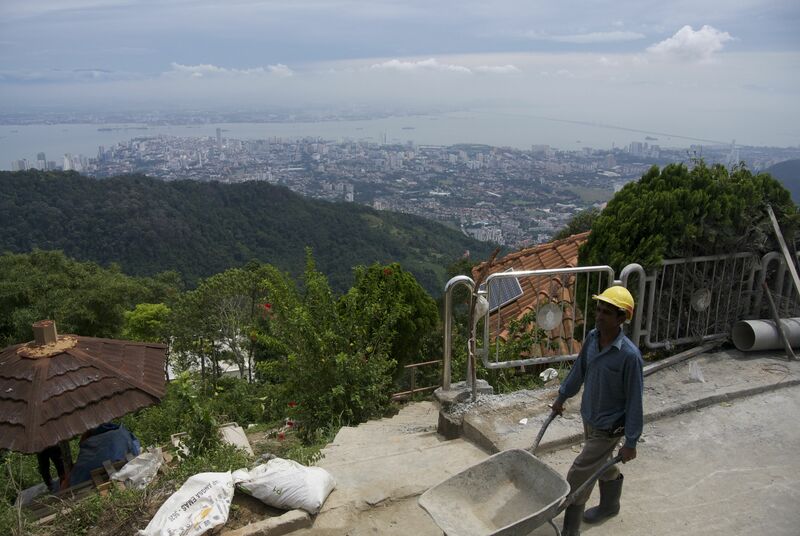 View from the top of Penang Hill. Some construction was going on for what looked like a bigger lookout point. The view is nice, but not spectacular. The beers continue and the owner continues to dominate everything that happens. He interrupts my conversation with the Englishman next to me more than once to give his opinion or ask me something. I explain to him that Mezcal and Mescaline is not in fact the same thing, despite having the same Latin root. When he wants to say something he turns down the house music. When he is done speaking, he cranks it back up. Lonely Planet describes this bar as “the kind of bar you wish you could throw in your backpack and carry with you across Southeast Asia.” I would rather continue this trip without a loud, bigoted bar owner with me, who treats his children like dogs and calls his American business partner a word I will choose not to print. The next morning I hike Penang Hill via the Moongate – one of the original British trails up the mountain. It starts with stairs built into the hill. Then some hiking, and then a 1.5 Km walk up the incredibly steep service road. At the top, I fear I don’t have enough cash on me to take the tram down the hill. I am right. I walk back the way I came. As I walk back to my hostel for a shower, the man that crossed the street with me and told me where the bus depot was is riding his bike down the street. He says hello. I say hello. He asks me if I like Georgetown. I tell him I do and then I assure him that it is better than Kuala Lumpur. My last night in town, I find myself at “Reggae Bar,” a place that I had intentionally avoided, but am convinced to visit by another American at the hostel. It’s not that I have anything against the music genre, but a reggae themed bar in SE Asia really is not what I’m looking for. I end up sitting outside, having a conversation in Spanish with a Colombian and a Spaniard, meeting a guy from Ozone Park, Queens, doing a shot of Tequila with some guys from Nigeria, all while listening to two guys with guitars cover American top-40’s of yesteryear that are decidedly not reggae. We order a beer tower, which is really just a large container of beer with a spout. I’m a little disappointed. The mythical beer tower falls short. On the ferry to Butterworth on the mainland, I am glad to be moving on, but know that I will miss the delicious food and the bustling but relaxing vibe of this place. This entry was posted on November 23, 2014 by alexjparton. It was filed under Asia, Malaysia, Travel and was tagged with bars, beer, buddhist, buddhisttemples, georgetown, hike, malaysia, monks, penang, penanghill, roti, temples, tourbus, tourism, travel, trek, vegetarianfood. Thanks, Anita! Nicaragua is an amazing country isn’t it? If you have any questions that I could possibly help out with feel free to shoot me an email. Look for more on here about Thailand and Myanmar. Thanks for reading.